Heat peas and water to boiling in 4-quart Dutch oven. Boil uncovered 2 minutes; remove from heat. Cover and let stand 1 hour. Stir in onion, celery and pepper. Add ham bone. Heat to boiling; reduce heat. Cover and simmer about 1 hour 30 minutes or until peas are tender. Remove ham bone; remove ham from bone. Trim excess fat from ham; cut ham into 1/2-inch pieces. Stir ham and carrots into soup. Heat to boiling; reduce heat. Cover and simmer about 30 minutes or until carrots are tender and soup is desired consistency. Preparing split peas for cooking is easy! Just pick over the dried split peas and discard any grit or discolored peas. Place the split peas in a bowl, and cover them with water. After a minute or two, remove any skins or split peas that float to the top. Finally, rinse the split peas in a colander. A slow cooker makes short work of a dried bean soup. Split peas don’t need as much attention as other dried legumes, but do be sure to give them a good rinse to remove any dust or bits of grit. They don’t need to be soaked beforehand. Looking for another option for a ham bone? Use 2 pounds smoked pork hocks. Serve a grainy cornbread (don’t forget the honey butter or drizzle of maple syrup) and a spinach salad with fresh grapefruit segments with the soup. The tart freshness of the citrus contrasts nicely with the rich, thick soup. Split pea soup has been a favorite winter warm-up for thousands of years. As long ago as 500 B.C., Greek farmers cultivated this legume, while Athenian street vendors sold hot pea soup to passersby. When King Louis XIV of France was hungry for pea soup, his court at Château de Saint-Germain-en-Laye served up its famous version, Potage Saint-Germain. These days, split pea soup continues to be featured in cuisines across the globe. In the Netherlands, for example, it’s known as “erwtensoep” and adorably nicknamed “snert.” The soup is often enjoyed by skaters who purchase it from outdoor food stalls set up alongside frozen canals. When you’re ready to try split pea and ham soup on your own, start with this guide How to Make the World’s Best Split Pea Soup, which features step-by-step photos of the process. 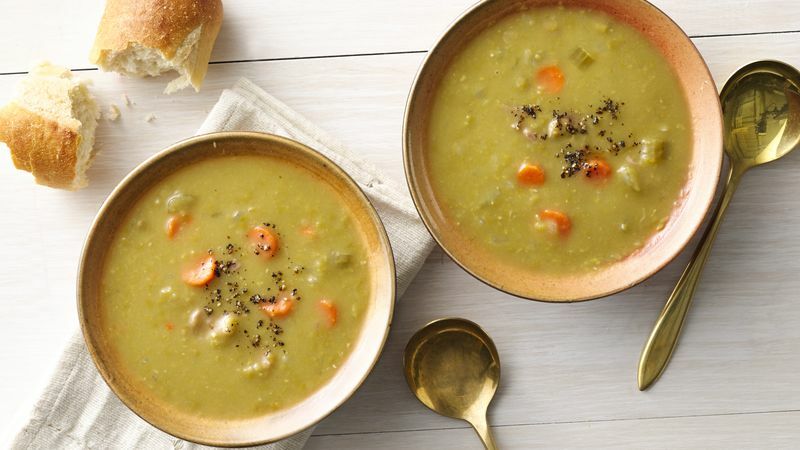 Once you’ve mastered this split pea soup recipe, check out Betty’s best soup recipes.